Join us for a celebration of the final weekend of Live on the Green 2018! The Lightning Lodge at Public Square Park is the place to be this August and Team Lightning will get the first (and last) glimpse! From unique activities to contests and meet and greets, the Lightning Lodge will have it all. Team Lightning Social attendees can expect complimentary food and drinks* while they meet all the folks that make Lightning 100 so proud to operate in Music City. You were probably planning on coming to the show already (if you weren't, have you seen the lineup?!?!) so why not enjoy good company and refreshements as we ring in the finale of #LOTG2018? Who: Open to the public! Come see how we make sure Team Lightning listeners live in style all year long! Pets: Live on the Green does allow furry friends, but please be cognizant of the fact that your pet will have to deal with loud noises, bright lights, and thousands of people. If you don't think they'll react well to that, then it's best to leave them at home. 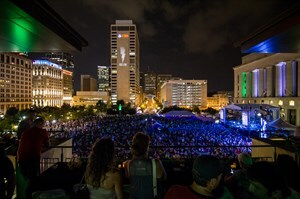 Check out liveonthegreen.com for complete pet policy. Kids: All ages are welcome! Registration: Registration is required to attend this Team Lightning Social! Only those on the official roster will be admitted, so make sure you register and indicate if you are bringing any guests!